Sometimes the dying let you know that they are ready – at least this has been true in my life and I am grateful. My job has been to pay attention, be open to what they need, and do what I can to help no matter how hard it was on me. On a Wednesday, three and a half years ago, my father told us his life time was over. On the phone he told me he was done. He died the next night after we brought in Hospice, gathered everyone together and told him it was OK to go. He had lived a meaningful and beautiful long life and was tired and in pain and ready. But he needed our help to get comfortable. I am grateful our whole family was willing to listen to what he needed and come together to send him off with prayers, poetry, music and companionship. During the summer of 2013, two months before my husband was diagnosed with cancer, one of our cats become ill. He had tumors in his mouth and it was incurable. 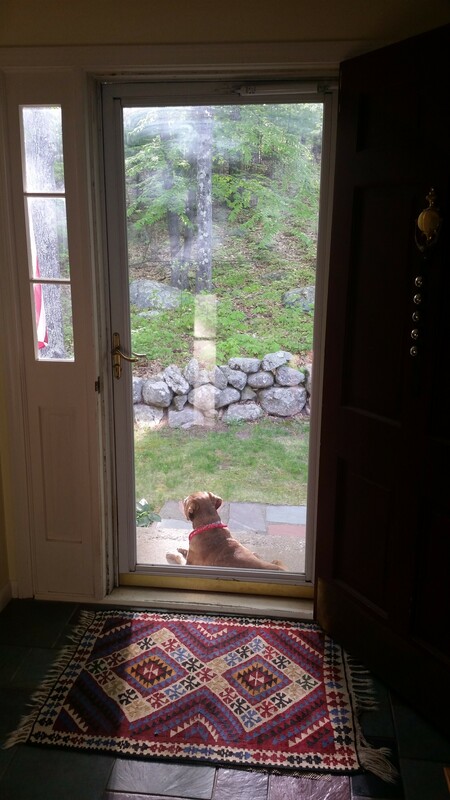 We were able to coax him along with special food for a week or so, but then one day he just sat by the door and did not move. He was ready to leave. He was uncomfortable and placed himself in a spot where I could not ignore what he needed. I told the kids that it was no longer about our wanting him to be with us, it was about what was best for him. Looking back I can see that experience as preparation for what was coming – the death of a father and husband. By September of that year my husband was sick. By October he was dying. November was a month of not knowing how and when it would end. In December we moved to a Hospice. All along we were able to talk openly about what was happening and prepare as best we could, but when was always on my mind. We brought family from overseas, had necessary conversations with our kids, and spent every moment together. One night at the Hospice I pulled the book Final Gifts by Maggie Callanan and Patricia Kelley (More about Final Gifts here) off the shelf and stayed up much of the night (wasn’t really sleeping anyway) watching over my husband and reading the book. It is full of stories about the terminally ill and the ways in which they have communicated their needs and helped those around them to meet those needs. That night my husband woke up from a dream, that if I had not just read that book, I would have dismissed as effects of medication. But instead I was able to see that this dream, and his need to tell me about it, was the start of our final days together. We talked about how we wanted it to go – how we hoped it would go – and asked for the support we needed. Last Friday our dog died. She been acting sick a few weeks before and the vet could not find anything wrong except perhaps the possibility of a bladder stone. But by the beginning of last week it was clear that either the situation had not resolved itself, or that something else was wrong. For a couple of days she did not greet me in the morning. Instead of her usual please feed me greeting she would not even look at me. She too was showing me that something needed to change. An ultrasound revealed a large tumor and internal bleeding. I called my kids from the vet’s office and we all agreed on what to do. Brutal decisions, heartbreaking sorrow, so much loss…. I do not know anything about death except these deaths of loved ones who were terminally ill. But I am grateful to the core that the dying in my life have let me know and I have been able to listen.